Faces of people with shingles. This webpage describes one person using a memory technique to gain immediate relief from the pain and itching of shingles. His experience confirms a long standing hypothesis of the two principal researchers in doyletics, Bobby Matherne and Doyle Henderson, namely, that the memory technique known as a "speed trace" would offer relief to suffers of shingles. This is only one case, but it is clear from this one experience that the hypothesis has been confirmed. More data and more cases will be investigated as they come up. We encourage you to share your experiences with the Principal Researcher, Bobby Matherne. To learn how to do a speed trace for yourself, go to the Introduction Page. Until this time, we had not mentioned that the speed trace could offer relief for shingles because we had no reports of anyone attempting a speed trace while having the doyles of shingles present. When Warren asked the Plausibility Question, "What's a plausible thing that happened to me at age three to cause these shingles?" he got a memory of having spots on his arm, chicken pox spots. This provides additional confirmation that his speed trace was successful --- it confirms that the doyles that were creating the shingles syndrome were first stored at three when he had chicken pox. If you have shingles, the best thing to do is to see your doctor. If you cannot see your doctor immediately, and you have already done several confirmed speed traces, you may wish to do a speed trace to obtain immediate relief for the pain and itching, as Warren did, and then see your doctor for something to help remove the lesions. If you have had shingles previously, you should consider learning to do a speed trace now, so that you will be ready for the next time they appear. One speed trace, once it removes the pain and itching, will eliminate your having shingles again. That is not a promise, that is a prediction from our basic hypothesis of the Etiology of Shingles laid out in the next section. "On a return trip from Oregon, I was feeling miserable with lumps forming on the back, left side of my neck. One lump in particular made me think I had gotten Cancer. But later on I began to break out with many more such spots and the itching was fierce. Then I began to think that perhaps I had been bitten by a herd of spiders. The lesions itched and hurt, and even when I would lightly brush my hair, in those areas, it would hurt. We were in our motor home traveling back to California on a Friday when I decided to call my family doctor. Being unable to make an appointment for Monday, I made one for Tuesday. We arrived home Saturday evening and by Sunday morning, I felt so miserable I went to the emergency ward at the local hospital at 5:00 AM and there they told me what I had and provided me with two types of pills; one for the pain and one for the itching. On Sunday I took the pills they gave me which relieved the symptoms somewhat. However, at about 2:00 AM Monday morning, I woke up to find the pain and itching sensation which bothered me very bad. It was at that time, I decided to trace the doyles which accompanied the discomfort. I finished the trace at age 3 while at the same time, I recalled seeing the little red spots on my little scrawny arm. Within that hour, and perhaps sooner, I no longer had the pain or the itch. In my opinion, I no longer had need for the pain and itch medication. Of course I still had the lesions for which the emergency room doctor provided me with a prescription. My wife went to purchase this prescription but the pharmacy was out but managed to order a quantity for me. Two days later, my wife went to pick up that prescription at a cost of $7.31 per pill for consumption over 21 days. A total of $153.51. I took a few of these to help with the lesions but finally threw them out. Now about four weeks later, the lesions are all gone." Below is a photo provided us by Warren of his neck, chest, and shoulder region with the lesions of shingles present. Our hypothesis is that it is likely that if Warren had done a speed trace immediately upon discovering the first bump on his neck, the shingles would not have progressed to this stage. We have experienced that a speed trace in the beginning of a migraine, an allergy, among other things, tends to be as effective as waiting for a full-blown attack and actually prevents the major attack. Only more reports from other cases like Warren's will provide data as to whether this will hold true for shingles as well. What is shingles? Shingles is a painful skin eruption caused by the varicella zoster virus, the same virus that causes chicken pox. The virus remains dormant in a nerve root near the spinal cord after chicken pox. Fatigue,emotional upsets, immune suppressive drugs (such as corticosteriods), radiation therapy or unknown factors cause the virus to reactivate. When it reactivates, it travels down the nerve to the skin. Anyone can get shingles if they have had chicken pox but it is more likely to occur in older people. Following this Introduction to Shingles, are a series of emails between Bobby Matherne and Warren Liberty1 in 2002. Warren while on a trip in his motorhome found a small bump on his neck. When he got home he had it checked out and discovered he was beginning a case of shingles. The doctor gave him some inexpensive medicine right away and the hospital prescribed some expensive medicine at $7.31 a pill. 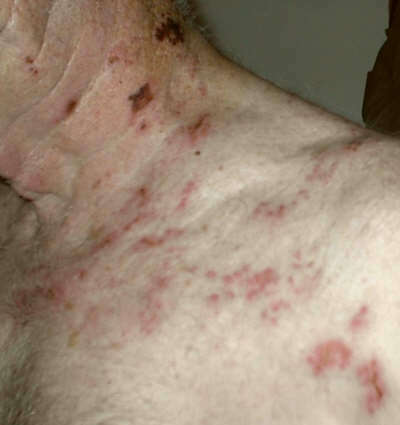 The photo above shows the lesions on his skin during the height of the course of his shingles. Warren has been a close friend of Doyle Henderson's for over 40 years and had already used a speed trace to remove a lifelong problem involving frequent, recurring headaches. As he lay in bed one night, the pain and itching was so horrendous that he decided to do a speed trace. At three years old, the pain and itching went away and has not returned. The pills stayed in the medicine cabinet and his case of shingles is subsiding on its own. Like a good doyletics tracer, he remembered to ask the Plausibility Question as soon as the doyles went away, "What's a plausible thing that happened to me when I was three to cause these doyles to be stored?" Immediately he got a flash of seeing his three-year-old arm with spot on it. Chicken pox. Medical doctors [See IUHC description .] know that one can only get shingles as an adult if one has had chicken pox as a child. Unless a medical doctor has studied the science of doyletics, the doctor would not know that one must have had chicken pox before about five years old. That is the doyletics Memory Transition Age -- the age at which doyles are no longer stored. What this means practically speaking is: events within the body from the age of five switch from being stored as doyles (physical body states) to being stored as cognitive memories (what we usually "memories"), and no more doyles are stored from then on. What does this mean for shingles sufferers? It means that one cannot have shingles if one had chicken pox after about five years old. Why not? Because shingles, we hypothesize, are the doyles of the original healing states of chicken pox triggered in an adult body in which there are chicken pox virus multiplying out of control. When the chicken pox virus multiplies in a child's body, at whatever the age, the body launches a massive attack to overcome the chicken pox. The result is what are called the "symptoms" of chicken pox, the most prominent in people's minds is, of course, the spots that give chicken pox its name. This massive response to the chicken pox virus is what we call the "healing states." These healing states are physical body states (doyles) which may comprise increased levels of antibody production as well as various other physiological changes that we call collectively "the symptoms of chicken pox." We know from doyletics that physical body states at an age below five will be stored as doyles that can be triggered later. It is known that once one has chicken pox that the virus lies dormant. That means it will never multiply out of control again. So it is not the presence of the dormant virus or quickly-multiplying viruses that cause the healing states to re-arise, but some other event. And when those healing states arise, you have the curious condition that may be likened to a Five-Alarm Fire in the absence of a fire to put out. Think of the all the mess such an alarm would cause in any city: huge fire trucks roaring down the streets, uncoiling fire hoses, hook-and-ladder trucks with fire-fighting personnel climbing up to rooftops, etc. It will take days to clean up the mess left by such a false alarm. Likewise when shingles happens, it is a false alarm. The body gears up to correct a problem that doesn't exist and marshals all its resources to fight a virus in the skin, sending all its antibodies, etc, to the skin to fix a problem that doesn't exist, chicken pox, and in the process, creates a problem, shingles! If only there were a way to recognize those false alarms that cause shingles so as to keep from making such a painful and unsightly mess, one might think. The key word is "re-cognize" --- which means to "re-" -- once again; "cognize" have knowledge or perception of. If you first encountered the healing states after five years old, you "cognized" them --- that is, your body made a cognitive memory in your fully function neocortex. Any time a false alarm goes up in your body, your body/brain re-cognizes that it has happened before and does not send for the fire engines --- those onerous "healing states" we call shingles. If you first encountered the healing states before five years old, you had no way to cognize them because your neocortex was not fully functional yet. The same mechanism that creates what Freud called "childhood amnesia" makes it impossible for you, before five, to cognize or make cognitive memories of events of any kind. Your pre-five-year-old body is, however, equipped with a way of recording all events that occur in the more primitive root brain and limbic system, which is known to be fully functional long before birth. It stores the present status of all internal organs, muscle tensions, levels of antibody production, etc, in what we call for simplicity, doylic memory2. Later if some event triggers a false alarm, your body is completely unable to re-cognize it as a false alarm because it lacked the ability to cognize it when it first occurred. Result: you get shingles. What happens when you do a speed trace on the shingles? You track the original chicken pox doylic memory down in its lair and when you arrive there, your brain, with its now fully-functioning neocortex, cognizes the doylic event. Thereafter, if some event triggers a false alarm, your body will be able to re-cognize the event in exactly the same way as someone who never has shingles. You will become such a person --- someone who never has shingles. You have via the speed trace enabled your body to re-cognize the false alarm of shingles and you will be free of those onerous healing states called shingles from then on. As you know I have used the doyletics technique to eradicate numerous things in my life; the most astounding was when I eliminated forever my life long headaches. That of course was followed by eliminating the tears down my cheeks while watching a sad scene at the movies, followed by eradicating much that angered me, etc. Today, I think I found something that will requires some thinking. Seven days ago, I took off on a motorhome trip and during the second day, I discovered I had a lump on the side of my neck. Thinking it was perhaps cancer I began to worry. Then after realizing my motor home had sat around parked for over six months, I decided I had been bitten by a spider. I left for home about three days later and during the return home I made an appointment to see a doctor. This morning at 5:00 am I decided to go to the emergency ward at the hospital and find out what it was all about. Right off the bat the doctor asked if I ever had chicken pox. Sure enough, SHINGLES. It usually starts out in infancy and as a person passes about 50 or so, he tends to get shingles. A rash and small blister like things all on one side of the body. They prescribed some medicine and indicated that it could get serious but it probably would not. I think that is a candidate for a tracing. If in doubt, trace it out. I will try it after a few days when I understand what doyles (body states) are triggered. Warren's Follow-up Email Describing his Speed Traces. I think I stuck oil. I'll let you know in a few days. I did about three traces. The first one I attempted to sit in a position in which I could clearly feel the itching and pain. The pain was not by any stretch of the imagination slight. It was about 2:00 in the morning and I was in pain, real pain. The next one I worked real hard on making sure I didn't allow any extraneous thoughts into my head as I traced while looking in a mirror and veiwing the lezions on my neck. In all cases I seemed to zero on a time between three and four years of age. However, I couldn't come up with any specific instance in which I had aquired those doyles. But who cares. I believe that by day after tomorrow I will have no sign of shingles. You both were of great help to me in this. Yes, you certainly seemed to have confirmed what Doyle and I suspected for many years now: that shingles can be treated by a speed trace that removes the doyles of chicken pox that got stored in doylic memory and whose re-triggering as an adult caused shingles to appear. Doyle called the body's reactions in the form of rashes, shingles, asthma, allergies and many other things to be discovered later by a very apt phrase which I adopted: "healing states". When a trigger goes off indicating the presence of chicken pox in the absence of active chicken pox virus, the body activates the same set of internal states as it used once to combat chicken pox. The result is the syndrome known as shingles. It is not a malfunction of the body per se, only an inappropriate response to the apparent presence of a disease which is not there. The result is the lesions, the welts, the itching, the pain, all of which is part of the body's strategy to creating an eventual healing. When you did the doyle trace in the presence of the pain and itching, you converted the doylic memory into a cognitive memory and your body stopped creating the healing states and thus the welts, itching and pain subsided and your body, no longer actively creating the healing states, is now moving into a quiescent state of no shingles and no remnants of the shingles episode. I'd ask you to arrange to live at least as long as Bob Hope so that we would have a longitudinal study of about 20 years or so. It appears that I have lost the vast majority of itching and have absolutely no pains left. I must attribute that to my tracing. However the red blotches have not gone away and I am predicting that they will be gone tomorrow, Sunday. Hey, what a matter with you guys. Here I sit at 6:14 in the morning with a great big water leak in my front lawn and the plumber isn't here yet, and I am trying to tell you that I've got the biggest new application of doyletics yet. As you know, I acquired SHINGLES, a silly disease that erupts when you get older, but only if you've had chicken pox as a child. I was suffering with a severe itch and great pains wherever I had a lesion on my skin around the left side of my neck and down my left shoulder and back. Although I had taken some pills obtained from the hospital, I still hadn't taken the big blaster $7.31 per each pills prescribed by the hospital. BUT as I lay in bed, thinking about this severe pain and extreme itch, I decided to trace it. I DID. Within an hour or two, I had absolutely no pain and no itch. I have had none since then and that is one week gone by.The sores are healing and beginning to look more human all the time. I am not sending this to the list because no one in their right mind will believe it was the doyletics trace that was responsible for a one or two hour recovery from a severe pain and itch that did it. No one that is except you two guys. No don't dilly dally around, give me your spin on what I have just experienced and see how or if it can be used. Yes it was quite a thrill to have relief within a couple hours of the intense pain and the frightening itching. But, no, the red blotches didn't disappear in that time, In fact, I still have them but absolutely no pain or itching. While lying in bed about 2:00 am, I was in misery with itching and pain and decided to trace the doyles (body states) that accompanied that misery back to its origin. Now mind you, I didn't consciously know exactly what those body states were but I knew they were stored up in my brain somewhere. My brain knew but I couldn't spell them out for you. Any way, I got down to three years of age and found they were gone. Now here's a very important point. I had a fleeting recollection of seeing the red blotches over my little scrawny arms when I was three years old. Just a fleeting thought of them. That was it, but it is important because that was, I think, reliving the onset of the disease chicken pox. That then, took the doylic memory out of its realm of (Freud's) childhood amnesia to current, cognitive memory and took it out of the hidden background into the current, present world and there was no disease at all merely a "memory brought to life now so to speak". When you try and tell that to someone, they will look at you like they think you are crazy. BUT there are so many things that can be eradicated in this manner it is scary to think that the professional people, for the most part, do not want to hear about it. BUT THEY WILL because Bobby's and Doyle's and my words will live long enough. Thanks to Warren for permission to share his experience with each of you reading this on the Doyletics Foundation Website. Thousands like you will read this eventually and be able to receive some help with their Shingles. Relief is just a Trace Away! I don’t want to go overboard with praise, but you are doing one terrific job. Your write-up on my shingles experience is out of this world. Thanks for such an effort. 2Once past five, your brain is able to cognize events. It no longer has to store events as doyles because it has a newer, more efficient means of storage, namely, cognitive memory. Faces of People who have Traced Away their Shingles!